Powdery mildew is a common disease that appears as a dusty or powdery white or gray fungus. It is one of the oldest plant diseases on record. The fungus covers the surface of leaves, stems, flowers, fruits, and other plant parts of affected ornamentals. It grows only on living plant tissue and does not require water or moisture to establish itself. It is identified by circular patches of powdery fungus that enlarge until the entire leaf is covered on one or both sides. Leaves may curl or twist, appear dwarfed or deformed, or have disfigured shoots, buds, or flowers. 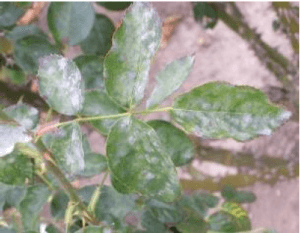 Uncontrolled powdery mildew on roses prevents normal flowering. It can infect new or old foliage, and its damage can be slight to severe. It is spread by spores that blow in the wind to other leaves and plants, and it can spread indoors to houseplants. Powdery mildew fungi tend to be either family-specific, infecting plants in the same family, or host-specific, infecting only one species of plant. Warm temperatures and shade encourage its development. It is not always a fatal disease, but may hasten plant defoliation and fall dormancy. Susceptible plants include the rose, euonymus, privet, photinia, sycamore, viburnum, crape myrtle verbena, and honeysuckle. Annuals and perennials are also at risk, including the chrysanthemum, begonia, calendula, California poppy, cosmos, gaillardia, zinnia, vinca, rudbeckia, ranunculus, pansy, dahlia, kalanchoe, begonia, snapdragon, and zinnia. Some vegetables and stone fruits are also commonly infected. Each species of powdery mildew has a very limited host range. One fungus that may cause powdery mildew on euonymus will not spread to roses, and vice versa. To prevent the disease, locate plants in sunny areas with well-draining soil, provide good air circulation, and avoid excess fertilizer. Also, feed plants with organic materials or slow-release fertilizers to keep them healthy. Irrigate plants in the early morning to allow them to dry out quickly, reducing the risk of infection. and prevent the fungus from establishing itself on wet leaves. If infestations are severe, prune, remove, and destroy infected plants. After pruning, disinfect your tools in a bleach solution of one part household bleach to four parts water. In some situations, fungicides may be needed for protection and to eradicate the disease. Once the mildew becomes extensive, though, it is hard to control with any fungicide. In general, sulfur-based fungicides are highly effective against powdery mildew if used before disease symptoms appear on susceptible plants. They can be damaging to some ornamentals, however, so be cautious. To treat plants, carefully spray the tops and bottoms of leaves every seven to fourteen days. Garlic contains high levels of sulfur and can be made into a homemade spray by crushing cloves in water and making a solution. Alternatively, a spray of one teaspoon of baking soda with one quart of water and a few drops of liquid soap works well. The baking soda increases the pH of the leaf, making it unsuitable for the growth of powdery mildew spores. Always use sprays with caution by testing them on a small portion of the plant. Read labels on any chemicals before application, and spray in the early morning hours or after the sun goes down when the weather is cooler. Avoid spraying during the heat of the day.